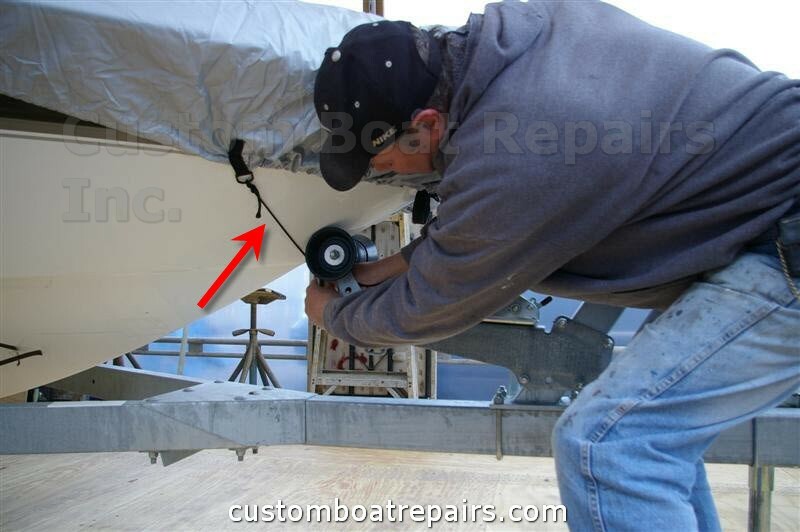 In these tough times many boat owners are doing repairs themselves to save some money. 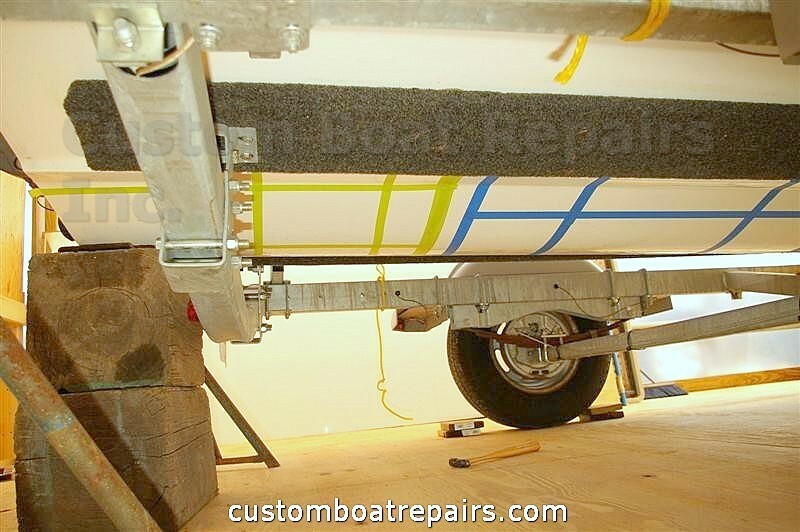 One way to cut cost is to tackle painting the bottom of the boat, but the main obstacle to completing this task has been the trailer. 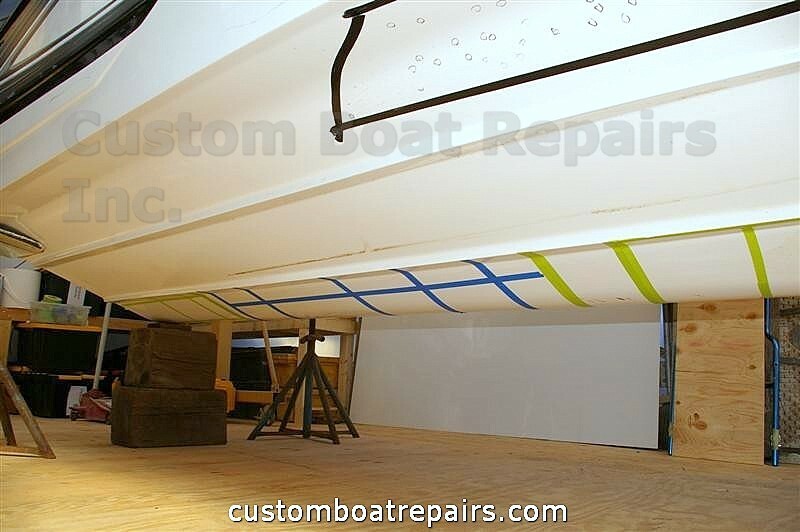 If you try painting the bottom of a boat while it is on a trailer, the job will be time consuming and you’ll be covered in bottom paint. I get many calls regarding how to take a boat off of a trailer. In this section I show you how I used to do just that. This method should work for you if you’re really careful and use the right equipment and the boat is between 15- and 25-ft long. The equipment I use today is more expensive and works quicker, but it costs too much money for the average boat owner to acquire. 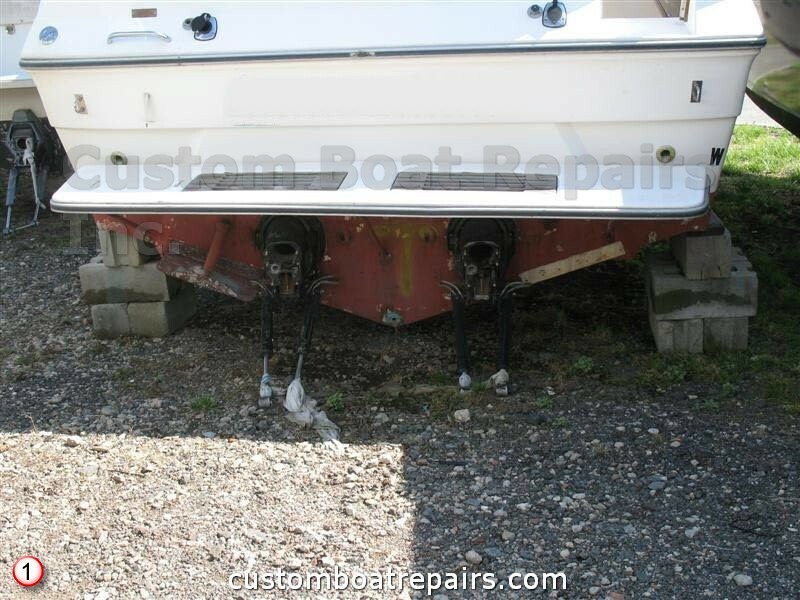 With this procedure, you can take your boat off the trailer and block it up for the winter or to work on the bottom for a very reasonable cost. 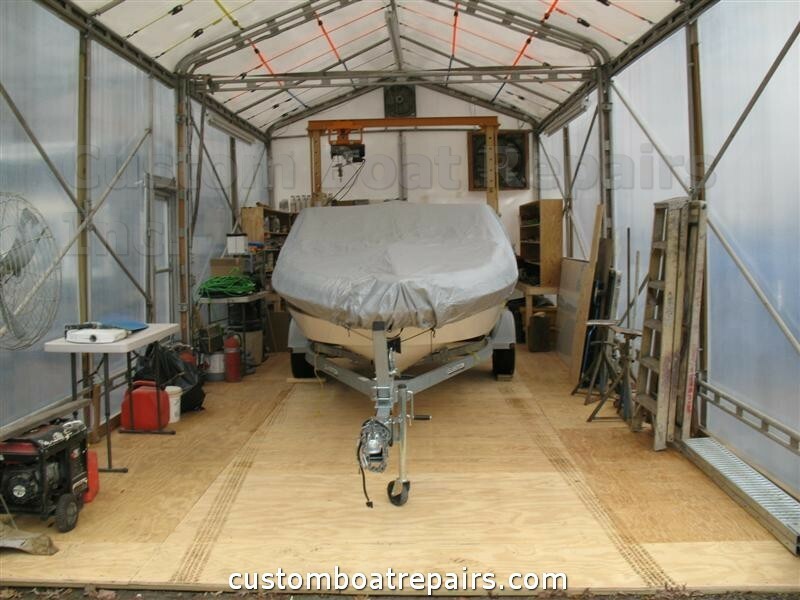 If you use a roller trailer, you should block up the boat for winter storage. 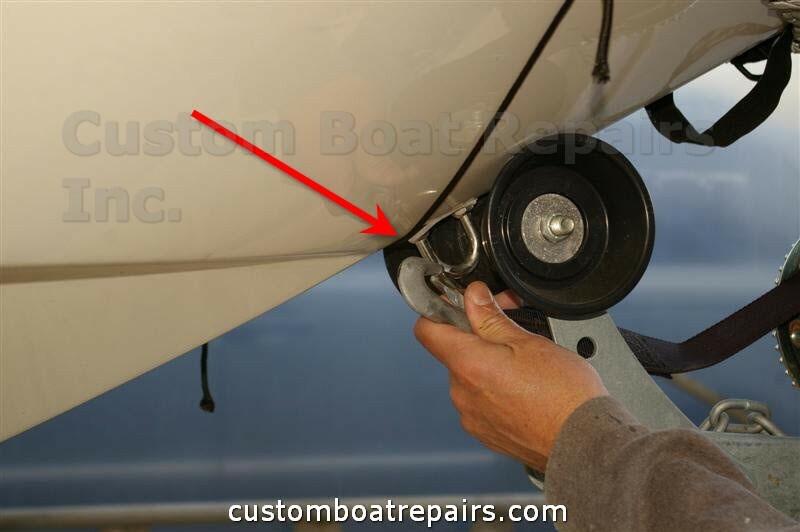 If you don't, the rollers will leave small indentations in the hull and possible stress cracks in the area of the pressure points. 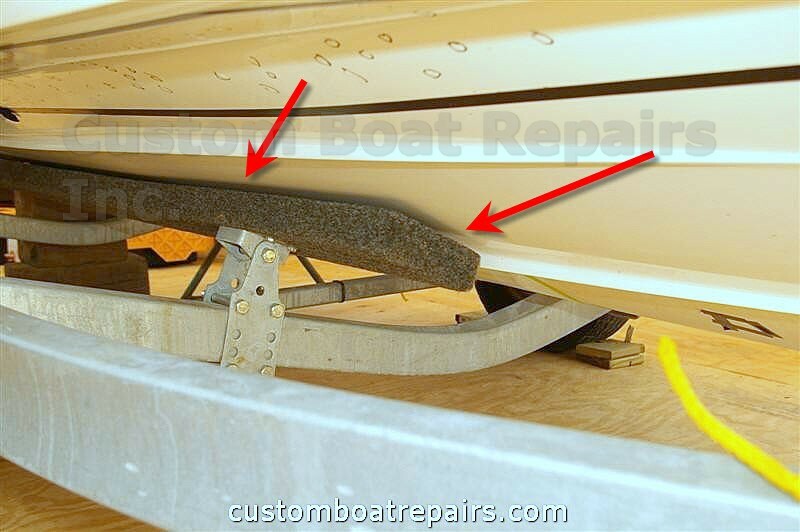 The rollers straddle the main stringer of the hull; they don't sit on the stringer like a bunk trailer. 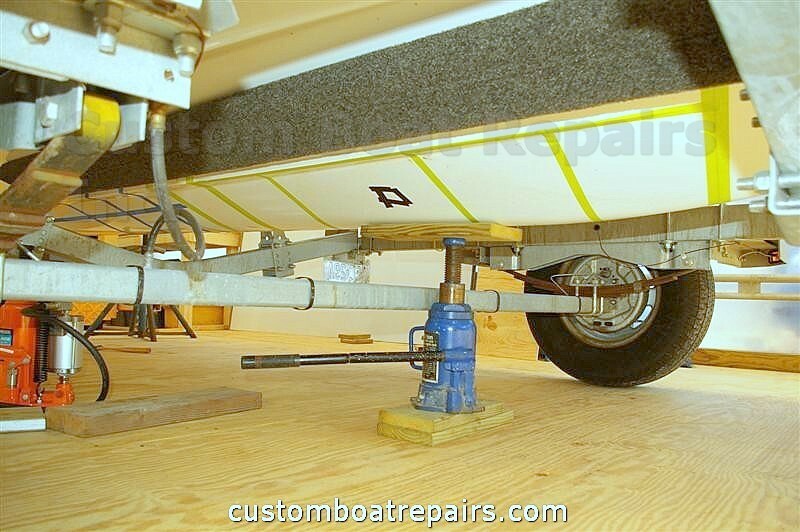 Also, if you trailer the boat a long distance to use it during the summer, it’s best to use a bunk trailer. Invest in boat stands. New, they run around $75 each; used, about $25 each. Look for 12" x 12" pressure-treated wood blocking. 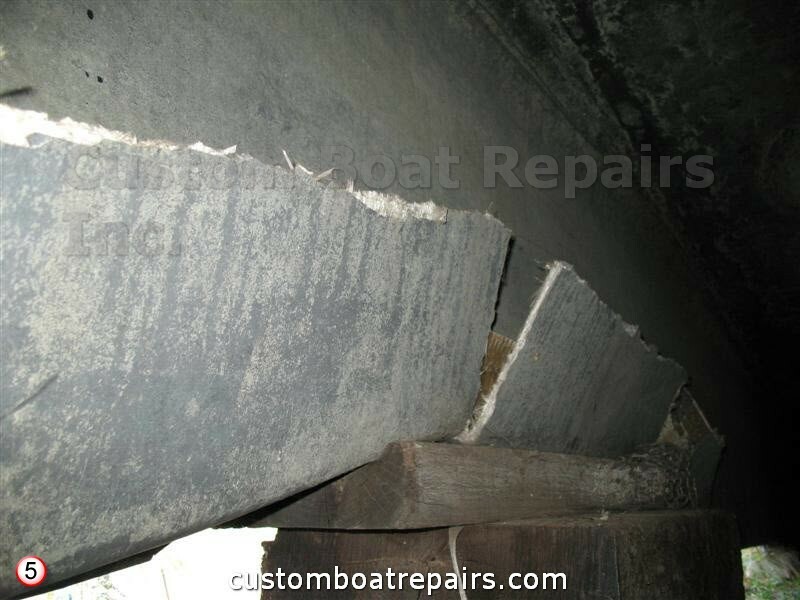 Do not use cinder blocks if you’re working on the bottom of the hull. If you can’t find the correct size blocking, you can use 6" x 6" pressure- treated wood from Home Depot or Lowes. You would glue four pieces together with Liquid Nails and then nail 12" x 12" x 5/8" plywood to the ends to make them one 12" x 12" unit and to keep them square and locked in place. When blocking up a boat, do not use a three-point blocking stance. 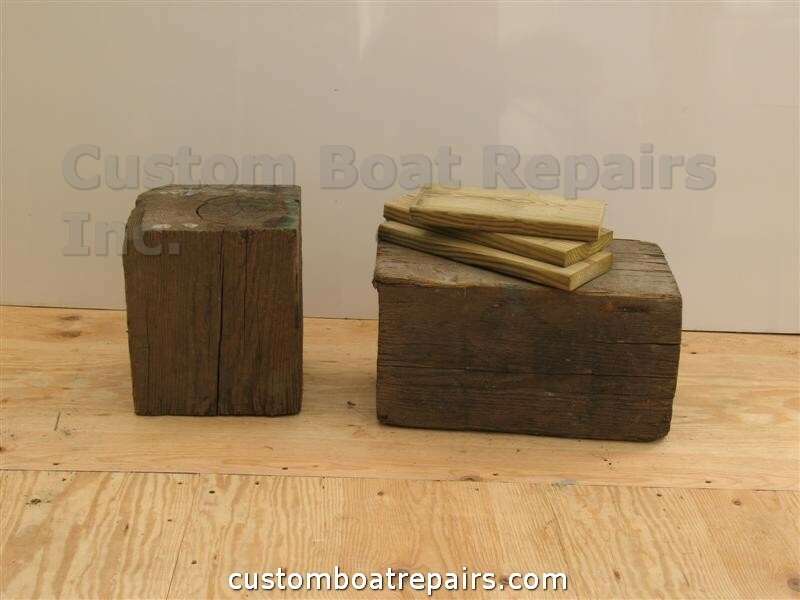 (See photos 1 and 2) For an 18- ft boat, you should have two main blocks under the boat and two boat stands on the port and starboard sides for a total of six contact points. Bigger boats require more blocks and boat stands (every six feet). So you will have eight contact points on an 25-Ft boat. Make sure you tap the bottom of the hull to find the inside supports so you know where to place the blocking. If placed in the wrong areas, you’re boat will look like the boat in photos 4-8. 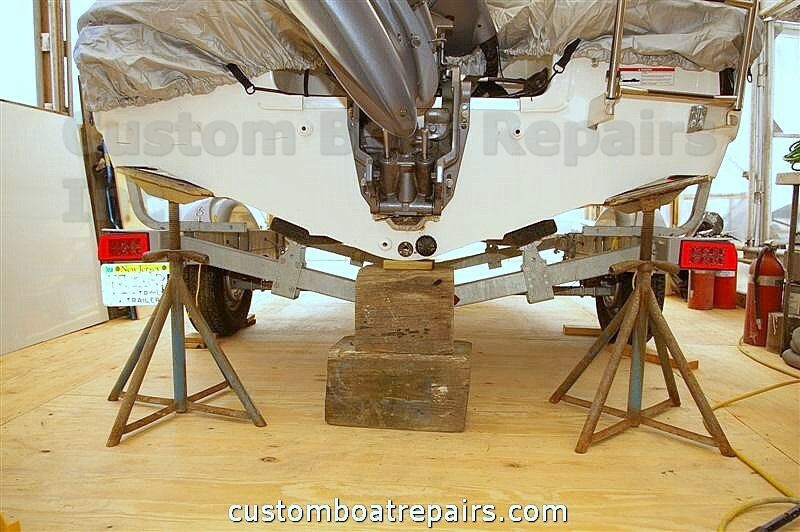 The boat stands are used just to keep the boat balanced and level. 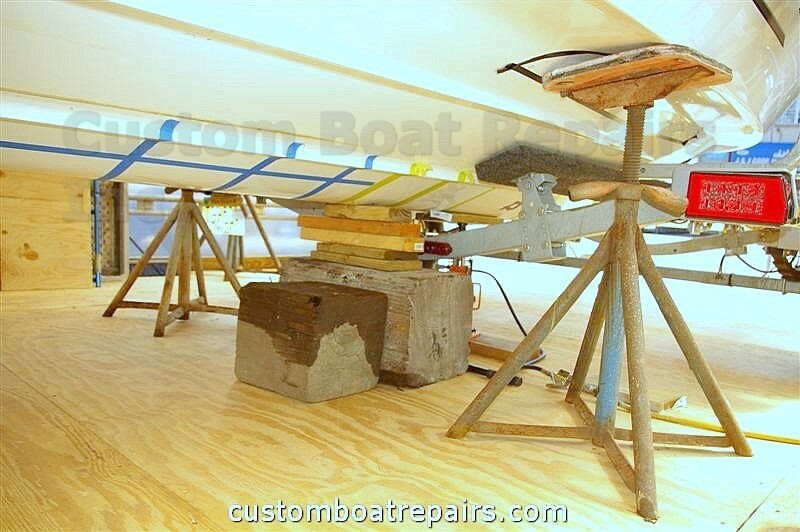 The main weight of the boat always sits on the wooden blocking. Note: As of this writing these links work. If you click on them and you go no where, search Google here. Cinder blocks low to ground blocking. Good for winter storage. Three-point blocking with cinder blocks. This is very dangerous. Never work on the bottom of a hull when blocked like this. Three-point blocking with boat stands and cinder blocks. Still very dangerous. This is what happens to cinder blocks. They crumble. 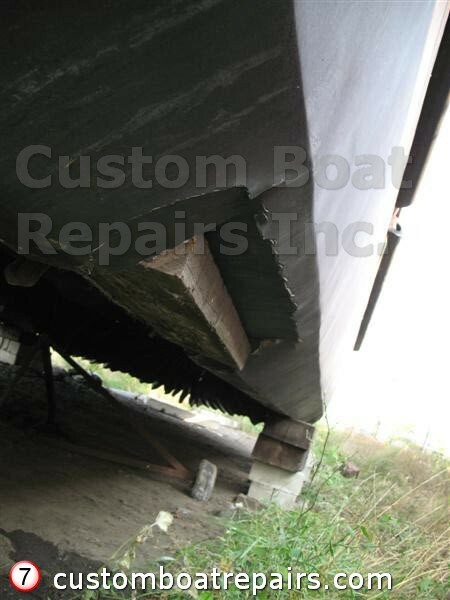 This is what happens when you don’t tap the bottom of the hull to look for inside supports. The blocking goes right through the hull. Here the blocking is stuck in the hull. Here is a boat stand set up in the wrong area of the hull. Warning: If you don’t have the right tools, or the ability, then do not attempt this procedure. If you do try this, make sure you have an extra person watching. 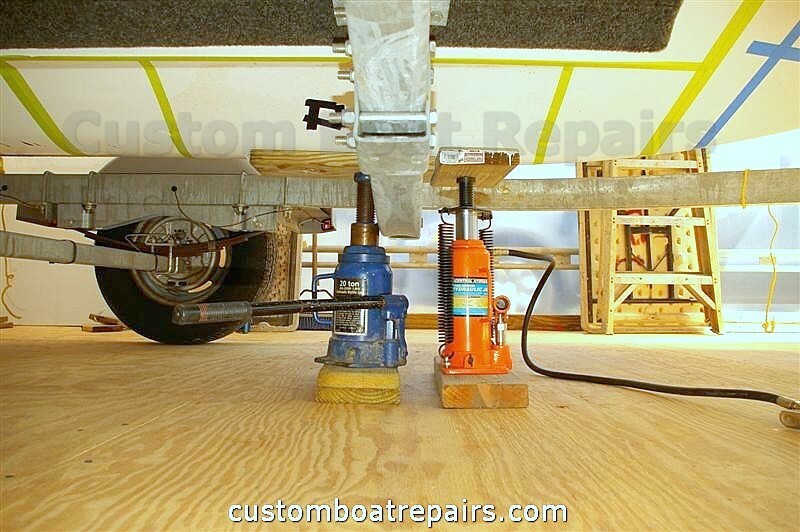 Do It Yourself Step-by-step Photo Guide: How to take your boat off a trailer. First, you want to block the boat on a hard, level surface. If you block it up on an asphalt driveway, you’ll need to put down plywood first. The stands will dig into the asphalt when it gets hot outside, and the plywood will prevent this. I use 5/8" plywood cut into 2' x 2' sections, and the stands are placed on top of them. 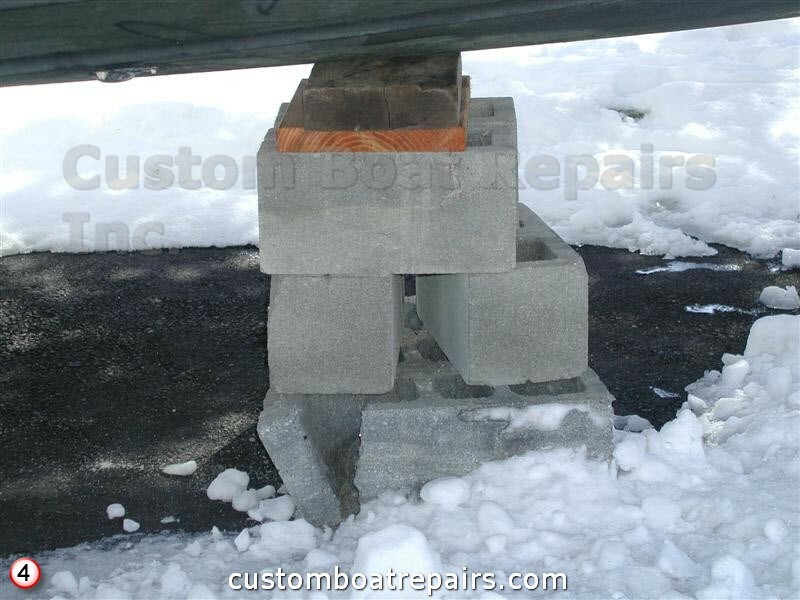 Once you have chosen a spot, put some wooden blocks in front of the tires so the boat won’t run you over when you lift the back of it. 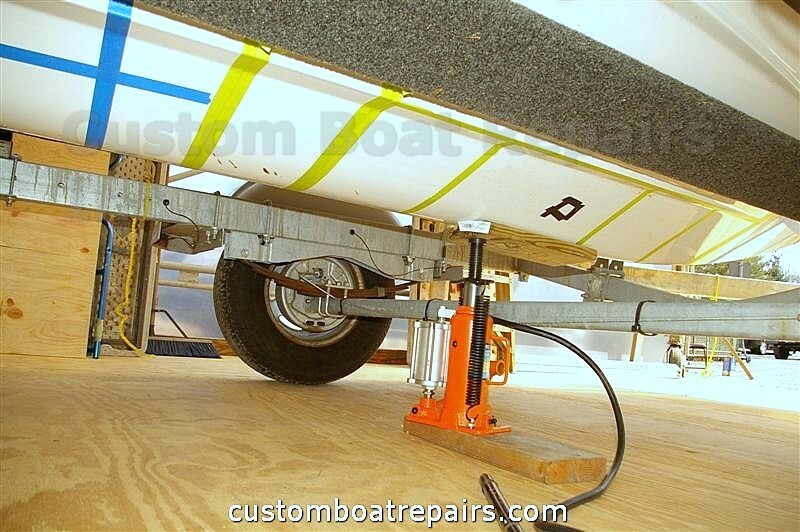 Remove all boat-covering strapping that is connected to the trailer. 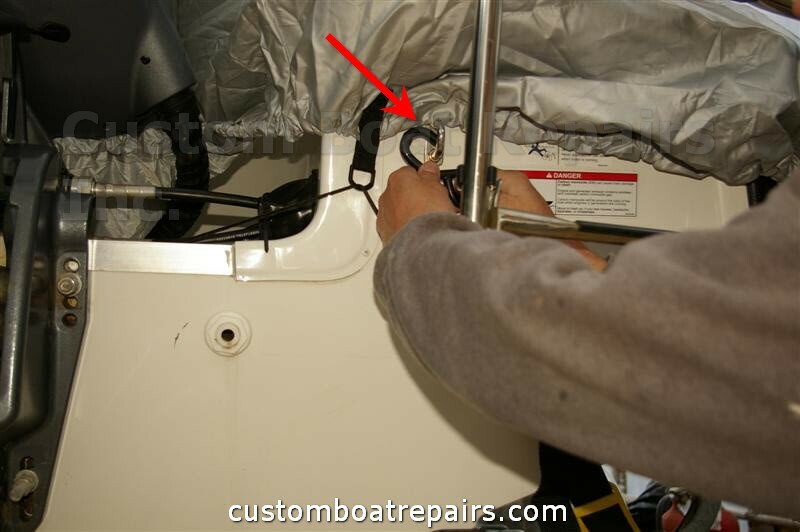 Remove the front tie-down by the bow eye hook. 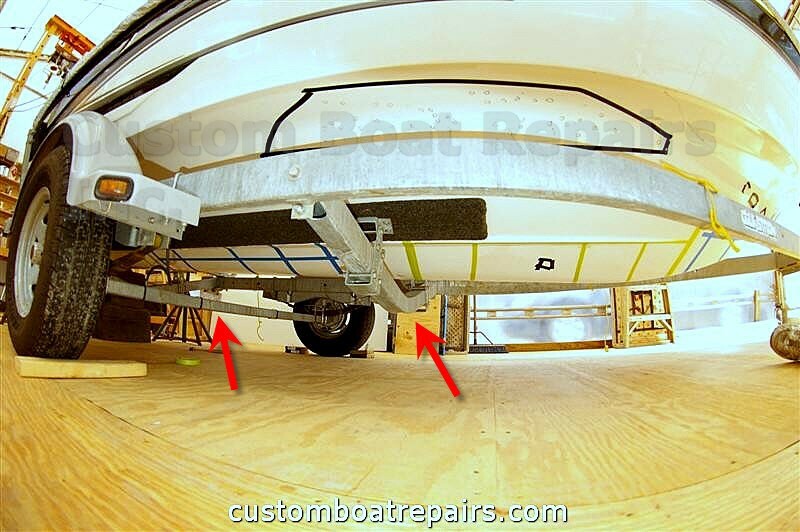 Remove the rear tie-downs on the transom. 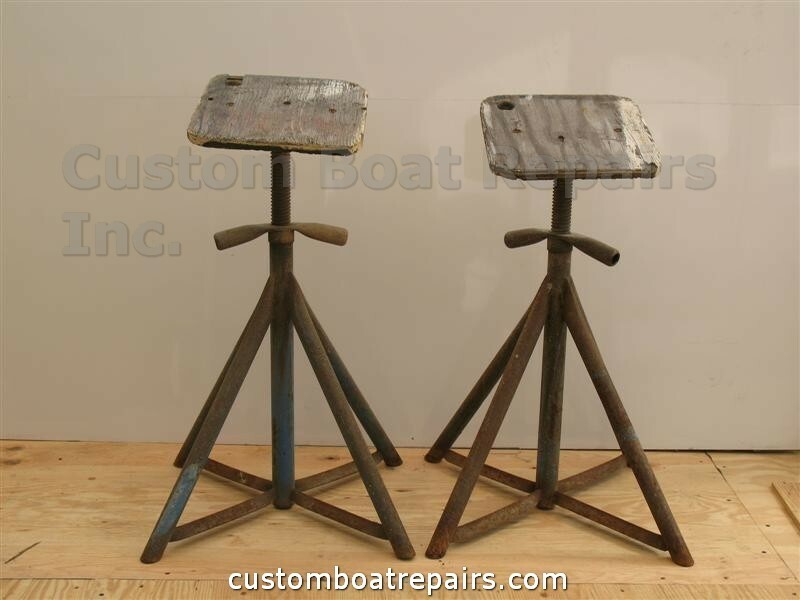 You should have two of them: one on the port and one on the starboard side. 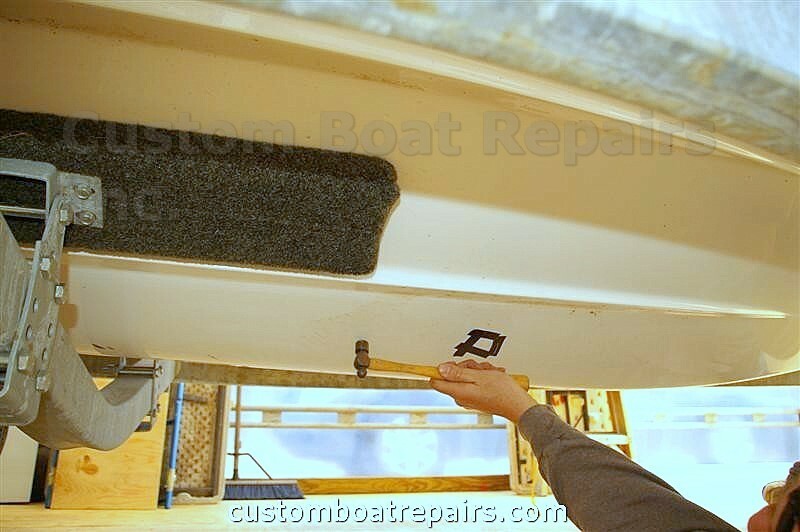 Place a small hydraulic jack, with a piece of wood to protect the hull, below the center of the transom and jack up the boat until you see a space on the bunk carpet support runners. Here is the space you’re looking for. 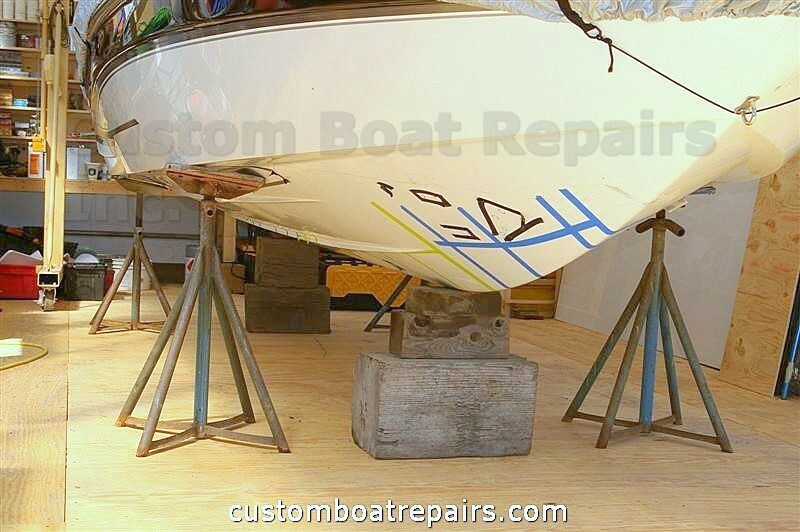 Once it’s up, place the boat stands on the port and starboard sides. Snug them up. Release the hydraulic jack and put the wooden blocks in place. 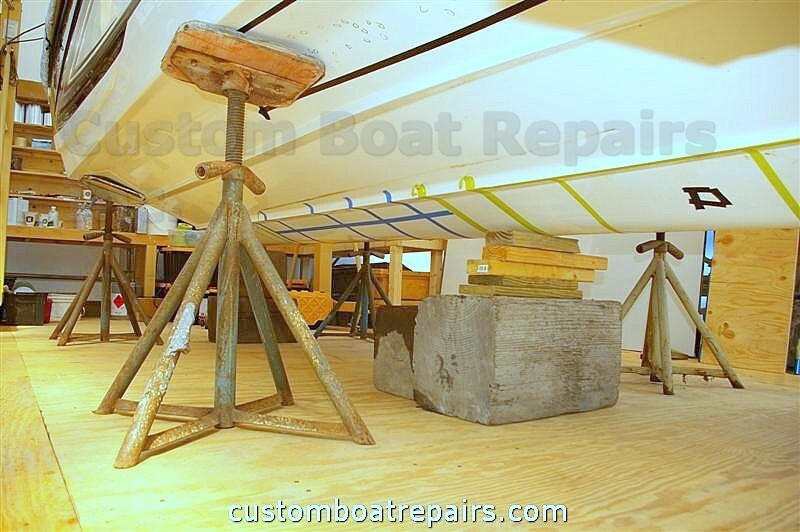 Then lower the side boat stands until the weight of the boat is sitting on the wooden blocks. You want all of the weight of the boat on the center blocks—the boat stands simply balance the boat and hold the it level when blocked up. 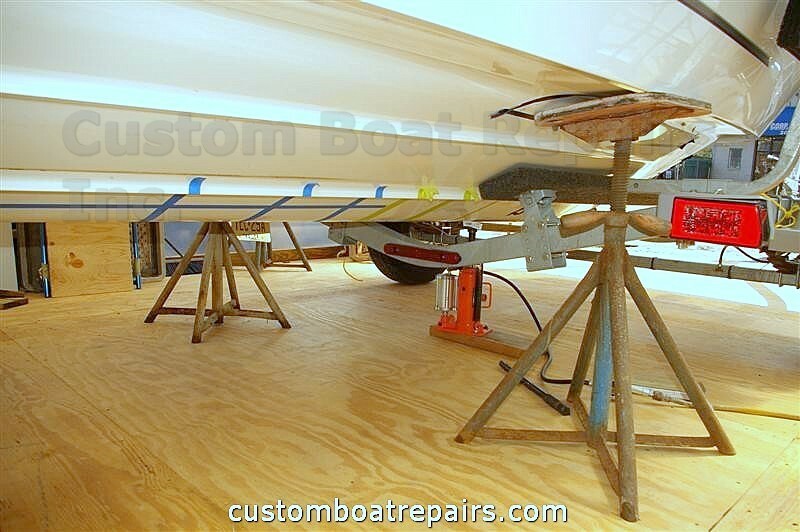 Then snug up the side boat stands again until the boat looks good and feels solid. Now go to the front of the boat. 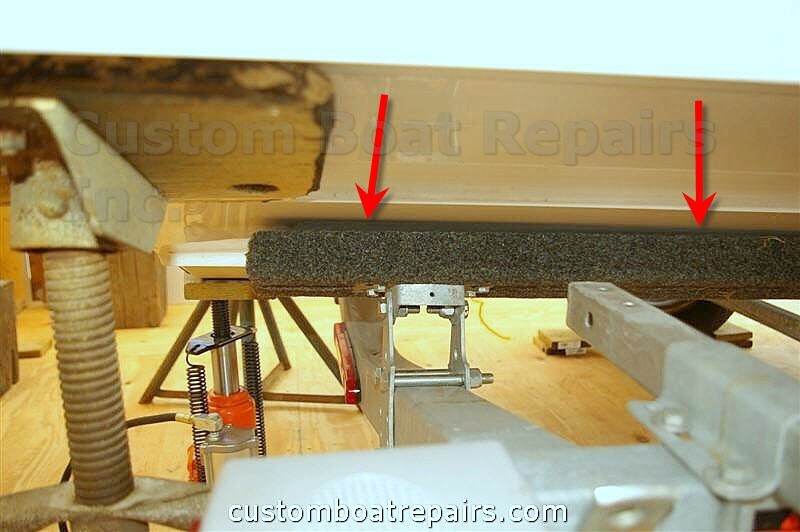 Get a small hammer and gently tap the length of the bottom of the hull, listening to the different sounds. 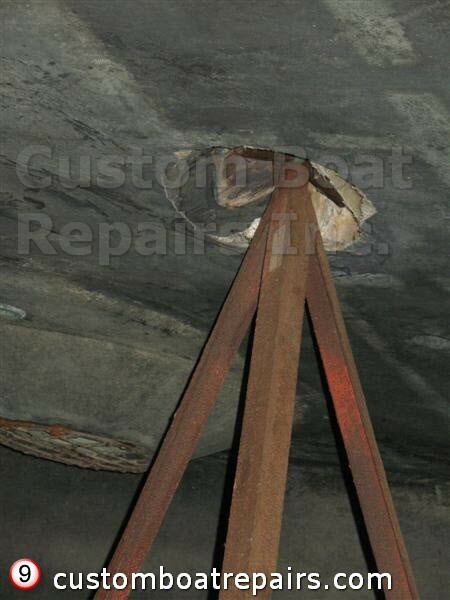 You’ll hear a high-pitched sound in the hollow areas, and a dull sound when a support or bulkhead is present. 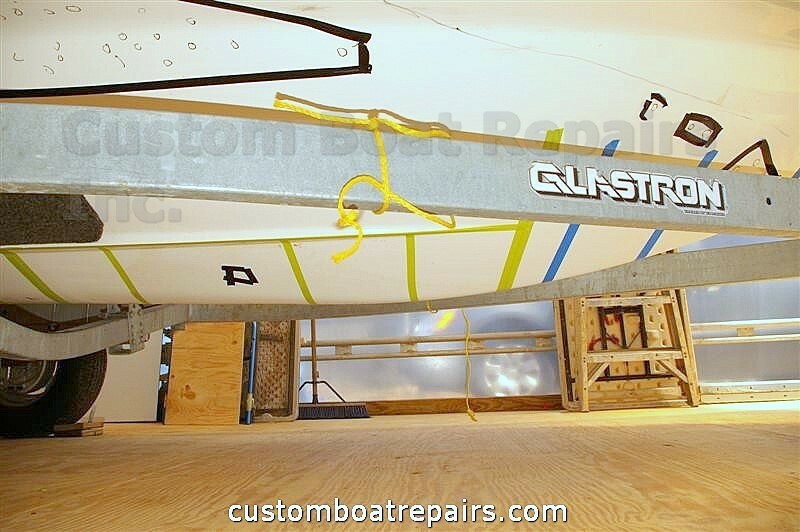 Use masking tape to outline where the supports are. 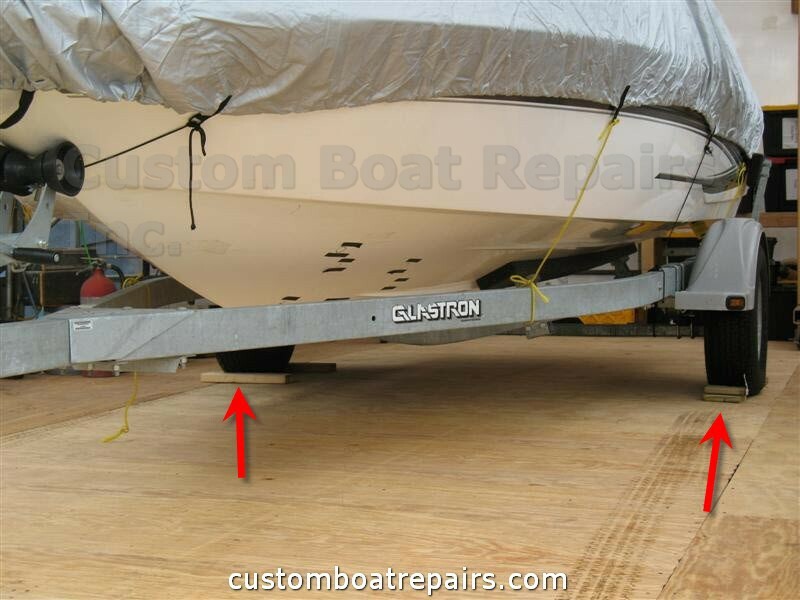 These areas are where the hydraulic jack will be placed to lift the boat up because supported areas are stronger than non-supported areas. 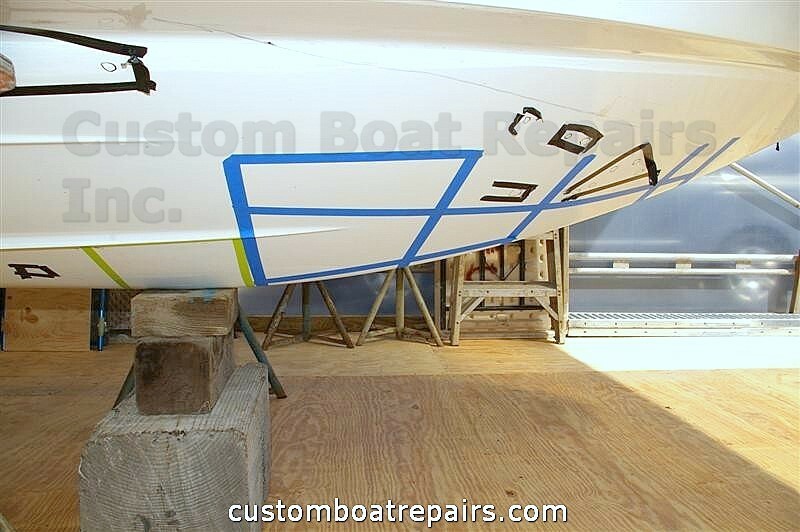 In this photo you can see how I have outlined the hull. The green areas are safe for blocking. The blue area is dangerous because there is a good chance the blocking will go through the hull. Here the blue tape is on the front section. 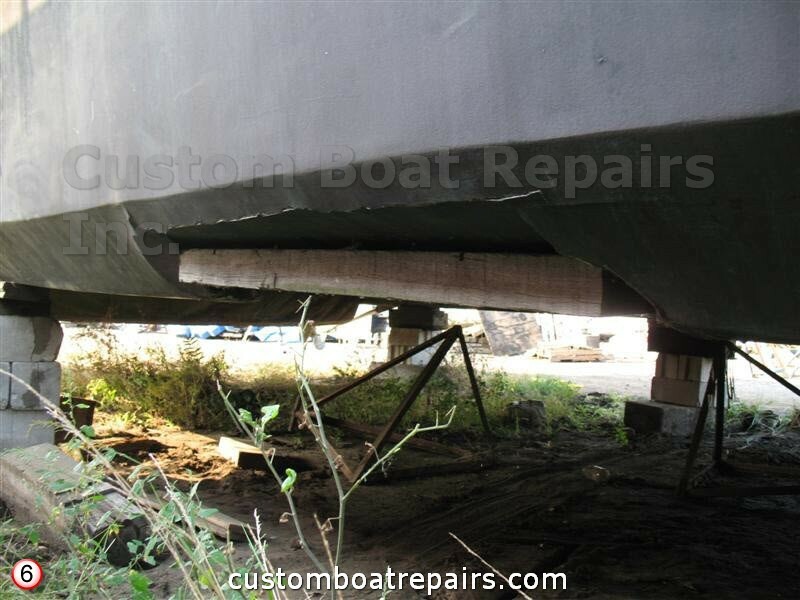 The reason you don’t want to put a block there is because it will slip out from under the boat. There is a sharp angle there. You want the wood blocking on flat, level surfaces of the hull. 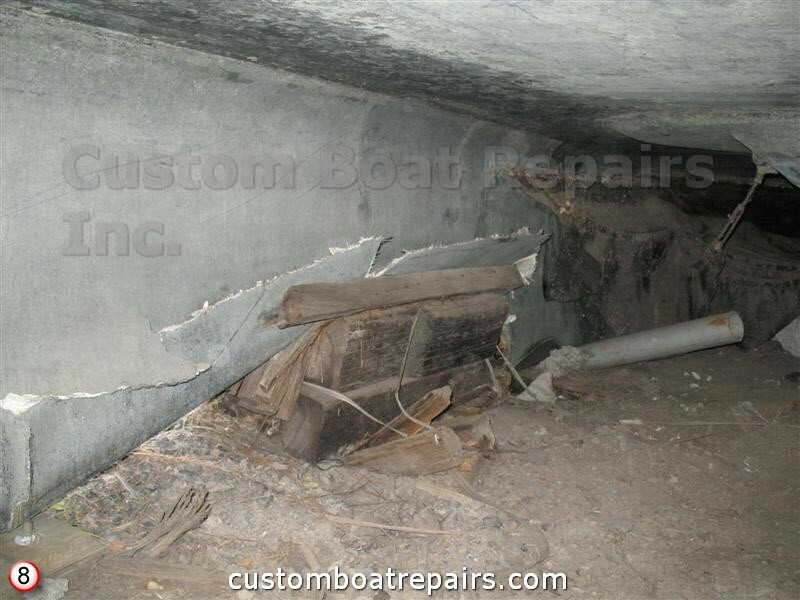 Here is a photo showing the bottom of the boat. You can see blue on the front section of the hull (sharp angle there, no blocking), with green next (good support areas), and blue after that (bad area: fuel and water tanks are usually in this area). The next green area is also the engine compartment. You can see the trailer crossmembers that you have to traverse in order to remove this boat. 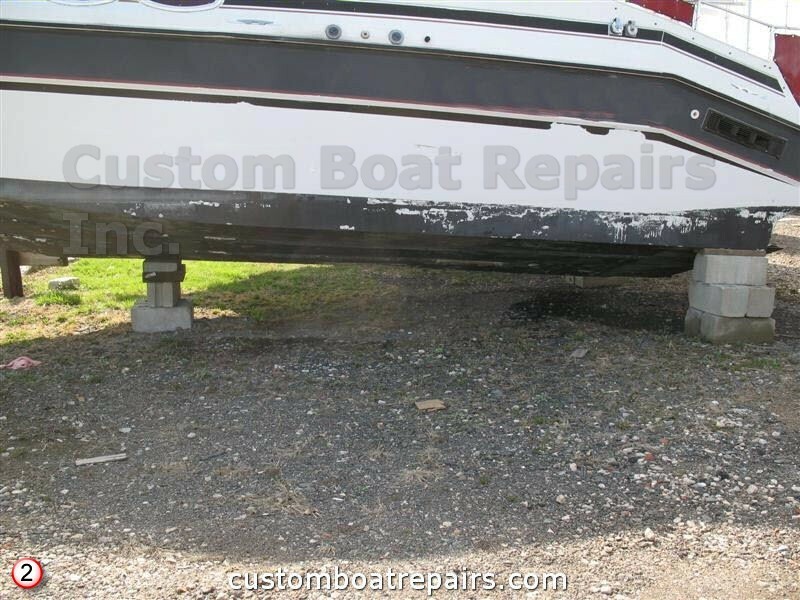 Now that the back section of the boat is blocked up, we have to get the front section up and the trailer out from under the boat. 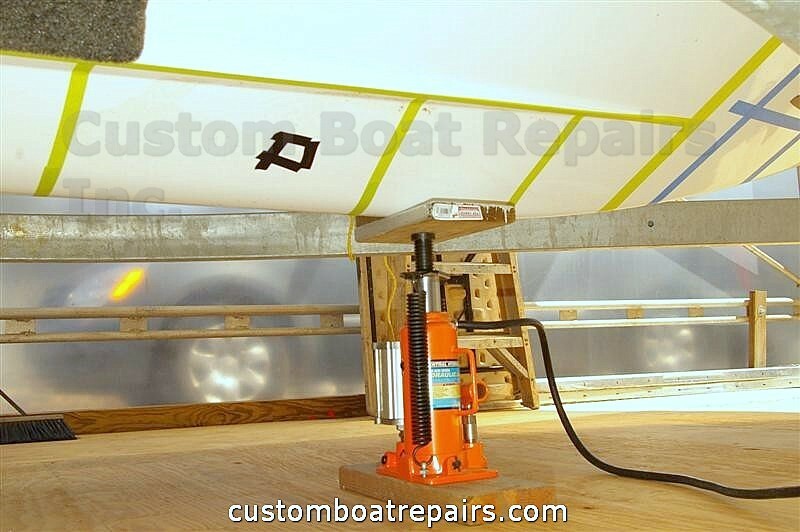 Get the hydraulic jack, place it under the center of the hull, using a piece of wood to protect the hull while jacking up the boat. 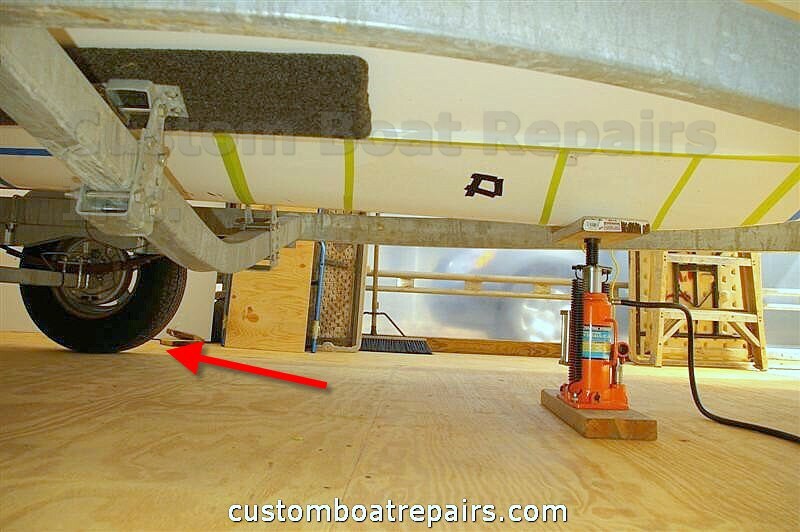 As soon as you see the boat lift above the bunk carpet runners toward the front of the boat, you can stop jacking the boat up. This is what the process should look like. Now you can remove the wood from the tires. 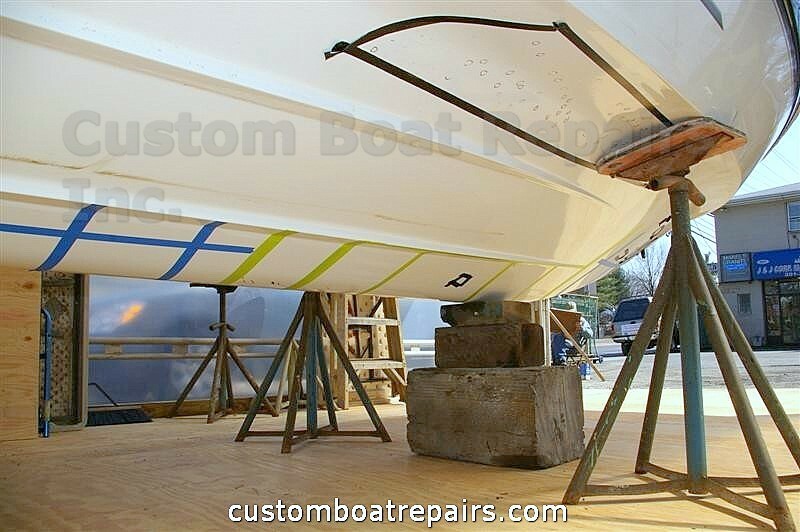 Pull the trailer out slowly until you come to the first support crossmember. STOP there. This is where you stop. 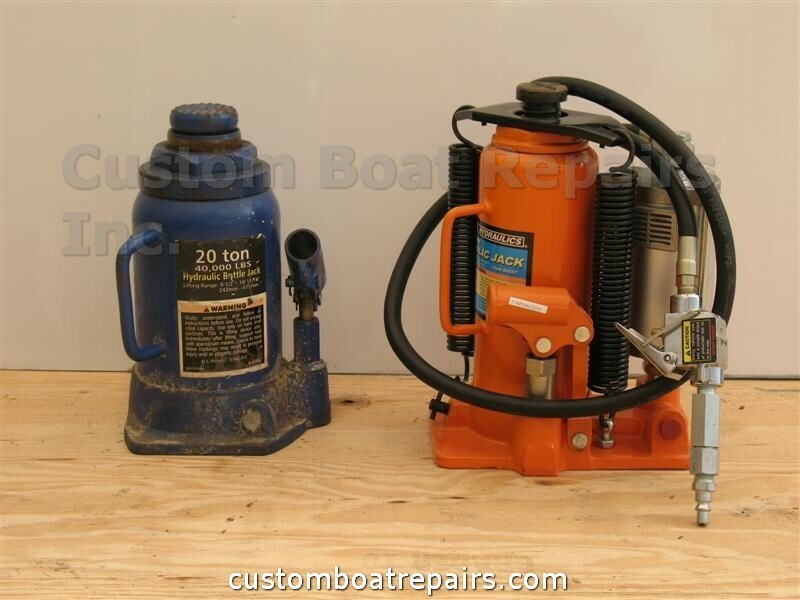 If you keep pulling the boat trailer, you will knock out the hydraulic jack and the boat will fall back onto the trailer and kick up the tongue of the trailer, possibly injuring you. Get the second hydraulic jack and place it behind the crossmember. Jack it up so the front hydraulic jack comes loose; remove that jack. This is what the hydraulic behind the first crossmember should look like. Now pull the trailer out until you come to the axle of the trailer. STOP there. The farther you pull out the trailer, the more dangerous the job gets if you accidentally hit the hydraulic jack. So take your time and watch what you’re doing. Get someone to help watch that jack. 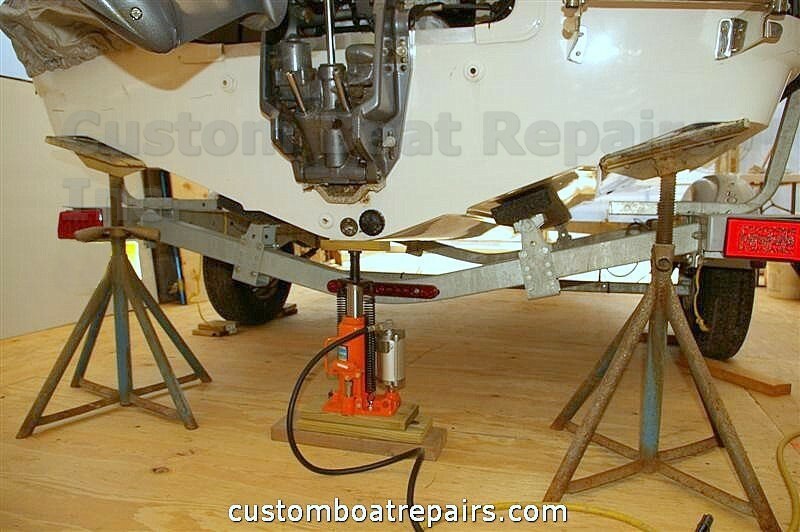 Next, place the other jack behind the axle before you remove the front jack. 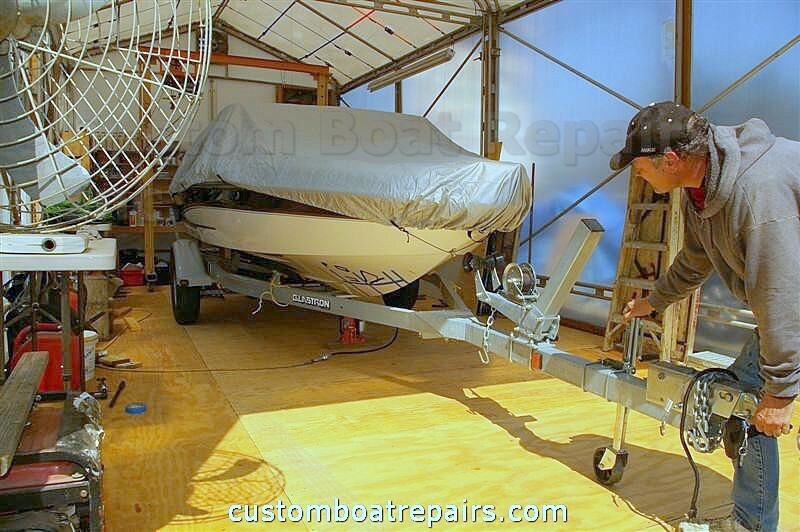 Jack up the boat and slide the trailer froward until you come to the rear and last crossmember. At this point, place the boat stands on either side of the boat as far foward as possible. Snug them up. 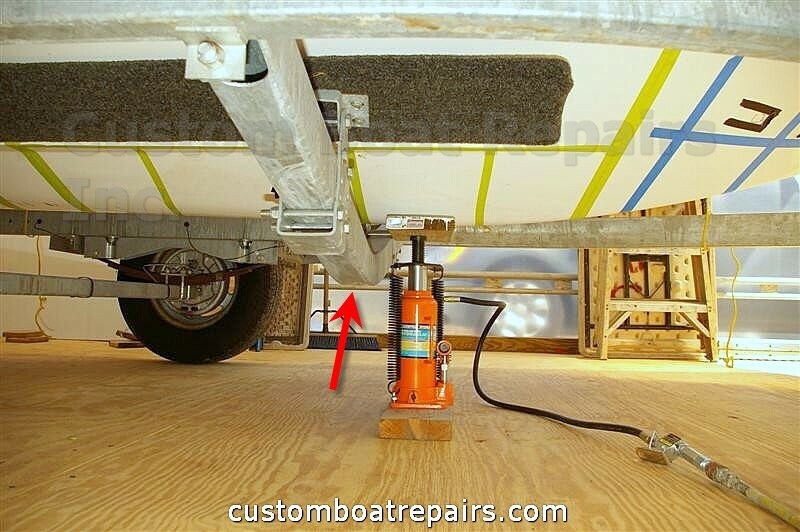 Place some temporary blocking under the boat as close to the rear crossmember of the trailer as possible. 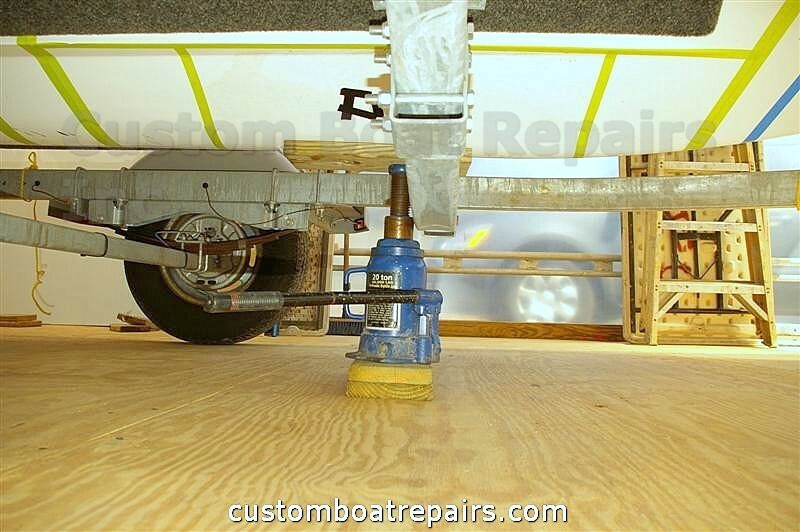 Lower and remove the hydraulic jack. The boat should be sitting on the block and boat stands. Use a solid block of wood to take up the space. Now that the trailer is out, set up the blocking as far forward as you can. 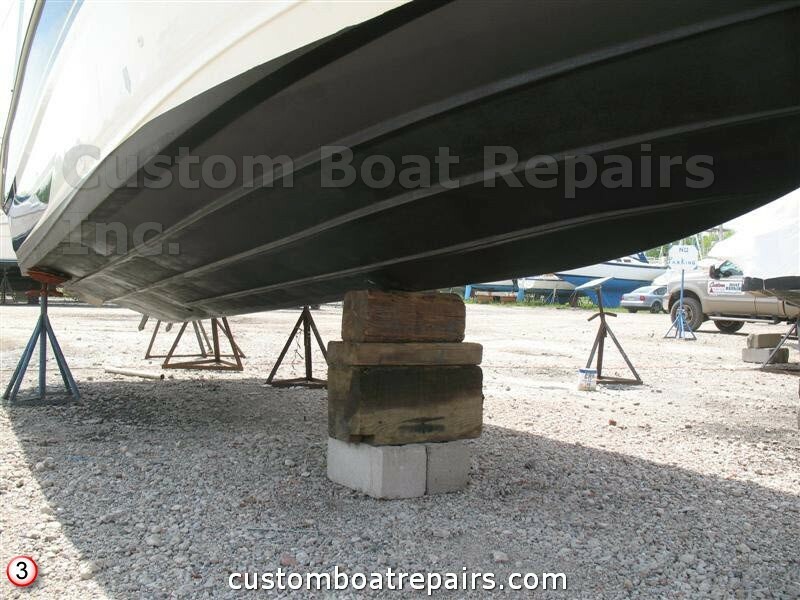 You can achieve this by raising the boat stands, sliding the blocks where you need them, then lowering the boat stands. This is a rear view of how it should look when done the correct way. This is a front view of how it should look when done the correct way.